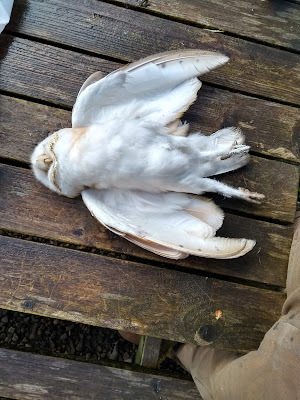 I found a dead, male barn owl this morning, under the beam in the barn where they normally perch and roost. It was so light weight almost as it were only feathers. 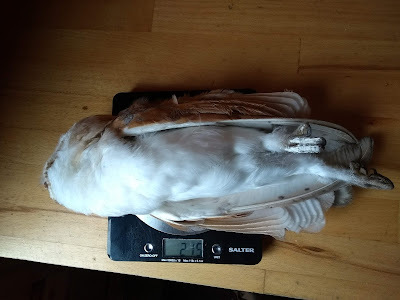 When I weighed it on my kitchen scales it was a mere 216g a healthy adult male should weigh 360g. The past three weeks have been cold, wet and windy, perhaps the tail end of "Storm Ali" that we got this week was the last straw after nearly three months of feeding three owlets. Hamza is away in Spain filming so it's now in the kitchen freezer. He wants to take it to a taxidermist!